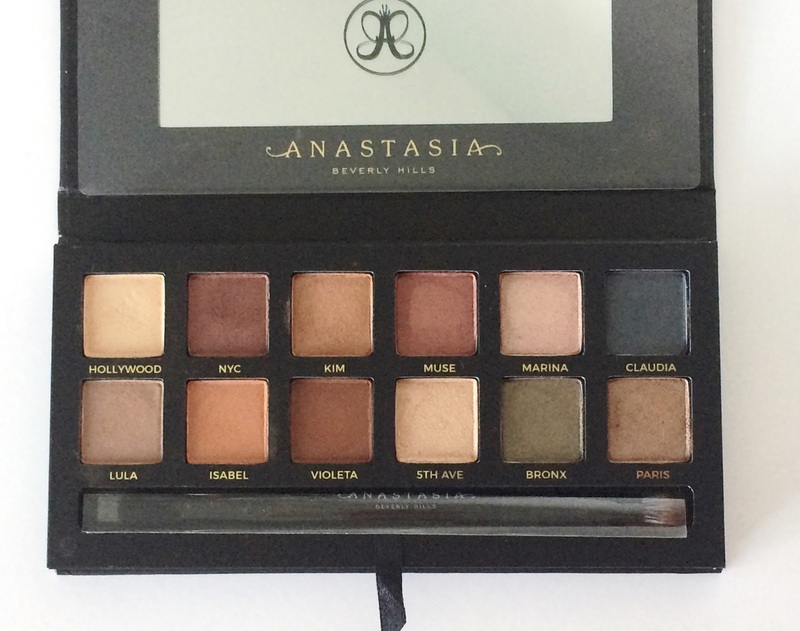 I already own two Anastasia Beverly Hills eyeshadow palettes and adore the texture (buttery soft), pigmentation and longevity of the shadows so I knew that I would not be disappointed with this palette, however I find the texture of the shadows in this palette to exceed the other two Anastasia palettes I own due to how soft they are. The case is made from sturdy cardboard and inside is a pretty good sized mirror, a double ended eyeshadow brush and 12 beautiful eyeshadows - a mixture of mattes and metallics. 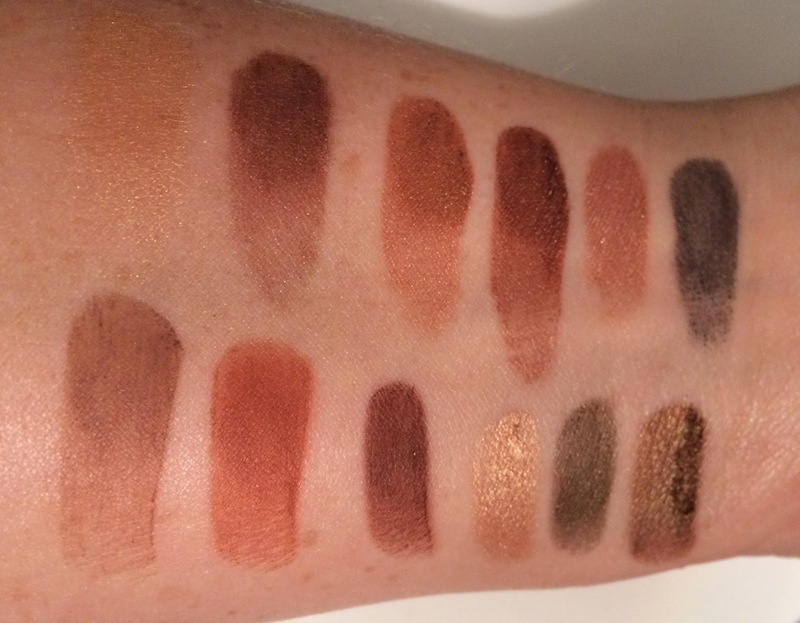 When I first opened it, I thought that it looked very similar to Cargo Vintage Escape Fall Eyeshadow Palette and Ciate London x Olivia Palermo Smokey Suedes Eye Palette but upon swatching, I found that this wasn't the case. In fact, I have gone through my pretty sizeable collection of eyeshadows (Nars, MAC, Stila, Makeup Geek, Natasha Denona, Marc Jacobs, Charlotte Tilbury, Urban Decat and many, many more) and I can't find any exact dupes. Yes, there are some similar shadows but nothing identical, I am sorry to say. If you would like to see a post with the similar shadows (rather than exact dupes, please comment below to that effect and I will do it). The warm tones in this palette are right up my street and unlike a lot of palettes, every shade is very wearable - not one dud in here. I would have loved if there had been some eye look cards included, like Too Faced supply with their palettes, but I have really enjoyed playing with it nonetheless. I always wear an eye primer because I have oily eyelids and these shadows literally do not budge for a good 8/9 hours on me - they don't fade, crease or transfer. Because these shadows are so pigmented (on a par with Natasha Denona shadows), I only need to barely dab my brush in the shadow. I know that buttery soft is a blogger cliché but there is literally no better way to describe these shadows - they are so creamy, easy to apply and a dream to blend. My favourites are NYC, Kim and Muse from the top row and Isabel, 5th Ave, Bronx and Paris from the bottom row. I am sorry that the swatches are not great in the photo above but the light kept changing - the weather was also against me - went from bright to dull and cloudy in the space of a few minutes! The palette is priced at $45, which is more expensive than the Modern Renaissance Palette by only $3, yet it has 2 less shadows than the MR palette. I was quite surprised by the price of this palette because when I bought the Maya Mia palette, it was priced at $29 - I know it had only 10 shadows rather than the 12 in this one. The difference in the prices is disappointing but to be honest, it probably would have sold out regardless of the price given the hype around it. Overall, I am totally in love with this palette and think it is definitely worth the hype. I have been reaching for it practically every time I have worn make-up since I received it and I have a feeling that this could be a palette that I will hit pan on. I noticed on Roses24 that you can join a waitlist to be informed of a re-stock so it is worth keeping your eye on there if you want to get your hands on this product. I know that there are plenty on eBay, but I personally wouldn't buy from there because you can't be sure of their authenticity. Did you manage to nab one of these palettes? Is is something you would like to have in your collection? I would love to hear your thoughts in the comments below!